Halo 4’s first birthday is around the corner! 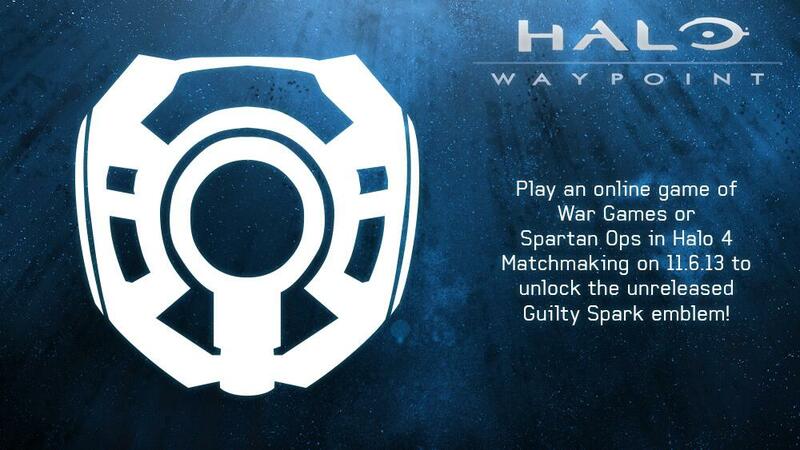 If you’re playing Spartan Ops or War Games Online on November 6th 2013 you will unlock the unreleased Guilty Spark emblem! *UPDATE! 343 Industries has said that the Guilty Spark Emblem will be released to those who did play online November 6th 2013 in a few weeks. No set date. Next week is Halo 4’s first birthday! Over the course of the past 12 months, millions of players have played Halo 4. Whether you spent your time in Matchmaking, Forge, Theater, Campaign, Spartan Ops, or elsewhere, we’d like to say thank you for playing our game. In fact, along with thanking you, we’d also like to give you a teeny-tiny-in-game-gift. All players who complete a game in War Games or Spartan Ops matchmaking on November 6th, 2013 will earn the Guilty Spark emblem. This emblem has not yet been released in Halo 4, and we hope that you hop online with some friends to celebrate the birthday of our first game and also snag a rare emblem. After, you can rock the emblem proudly and brag to your friends about how you attended the birthday party, and they did not. We’ve got also got some Matchmaking fun in the form of a 24-hour playlist planned for this special day, so keep an eye on Halo Waypoint for all the details. This entry was posted in Halo 4 and tagged gaming, Halo, Halo 4, Halo 4 Emblem, Halo 4 Emblem Unlock, Halo 4 Guilty Spark Emblem, Halo 4 Guilty Spark Emblem Unlock, unreleased Guilty Spark emblem, video games by Chief Canuck. Bookmark the permalink. It’s bugged for me, I completed a War games match and a Spartan ops match both online, I didnt get the emblem. They have stated that they’ll be unlocking the emblem in a few weeks. You just have to play today.